Last week I was faced to a strange problem while benchmarking MySQL 5.6: some of my user sessions become "frozen" periodically and finally my whole test was not valid..
sessions are "frozen" when executing a SELECT statement..
sessions are not really frozen, but waiting on read!.. the read seems to be a kind of long read, involving many I/O operations..
all makes think that query is execution a full table scan (200M rows, 40GB table) and ignoring indexes, so instead of 1ms I have >5min response time.. But the problem is completely "random" - it's not happening all of the time and not in all users sessions. And every time I'm executing EXPLAIN for any given "wrong" query - it's always giving me a right execution plan.. So, seems that something is going wrong on the time when queries are executed concurrently, and not when I'm trying to analyze them alone. Which means that I have to catch the execution state exactly on the time when the execution plan is wrong!.. So, for some reasons MySQL Optimizer is getting an information from InnoDB that my table containing only one single row instead of 200M rows.. Seems I was very lucky until now to never meet such a problem, but looks like the issue is real, and may happen time to time in InnoDB databases during table statistics updates. 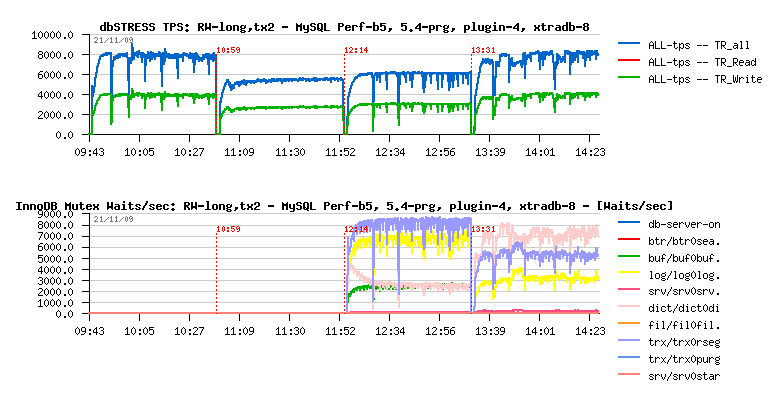 To avoid such kind of problems, MySQL 5.6 introduced InnoDB persistent statistics - once enabled, the statistics will be updated only on the next time of ANALYZE TABLE execution! So, if your table is changed frequently and widely, you have to plan regular ANALYZE of all such tables (via cron or MySQL Event Scheduler, depending what is a more simple for you). all my problems were gone! no more broken execution plan anymore!.. 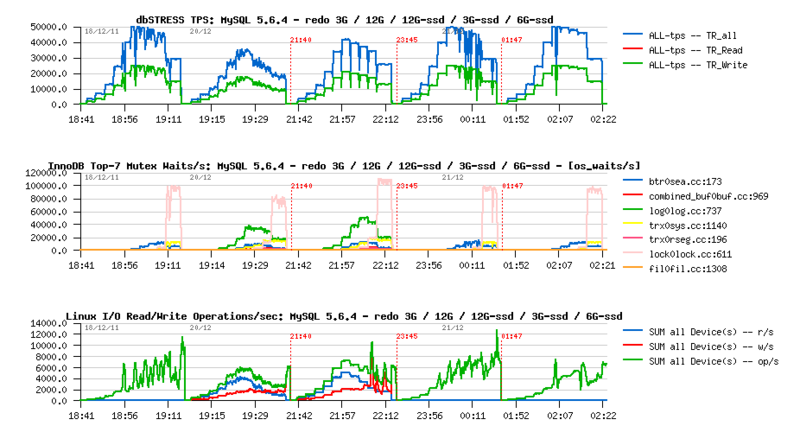 All tests were executed with 32 concurrent users on 12 cores server. 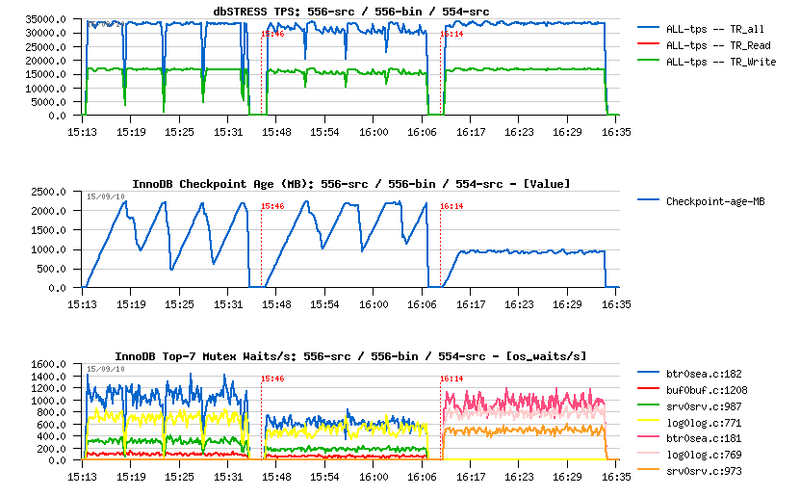 with enabled optimizer tracing: 28500 TPS => 20% degradation..
with enabled optimizer tracing: 41100 TPS => 16% degradation..
And seems that Persistent Statistics in InnoDB is the must! It just needs to have a solution for the most straight forward adoption on the user land..
Any comments and feedbacks are very welcome!.. 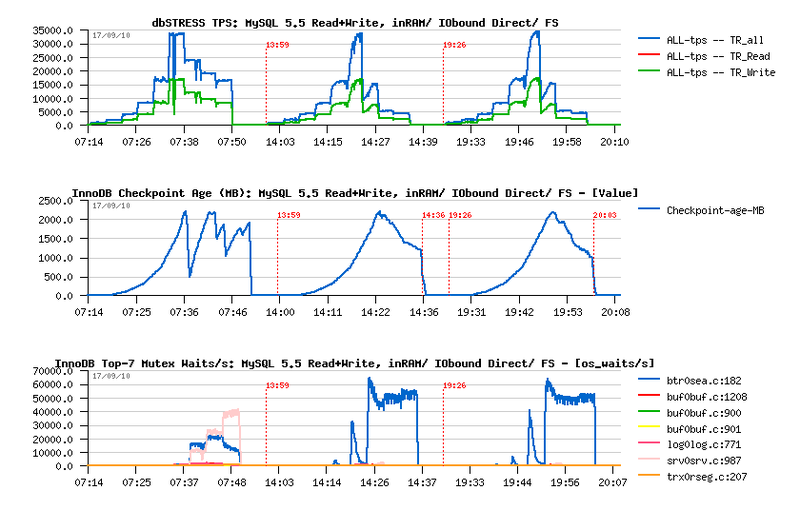 MySQL 5.6.4 milestone is here and I'd like to share some benchmark results I've obtained with it on dbSTRESS workload. 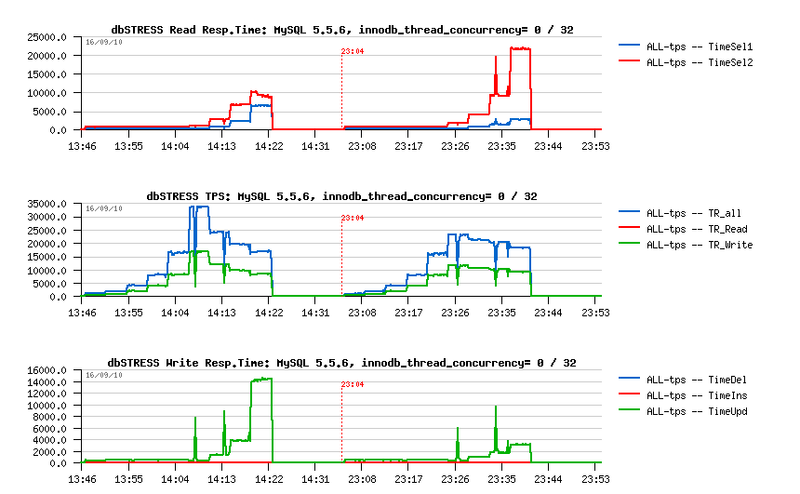 In 5.6.4 it was possible to suspect the effect of the Read-Only transactions optimization feature , but the results on 5.6.2 is the same or quite similar, and it did not have this feature yet..
Then, to compare apples to apples, I've compiled all binaries without Performance Schema - so P_S improvements made in 5.6 are not playing here, just pure code base..
Now, let's see how the things are going on the multi-user workload. 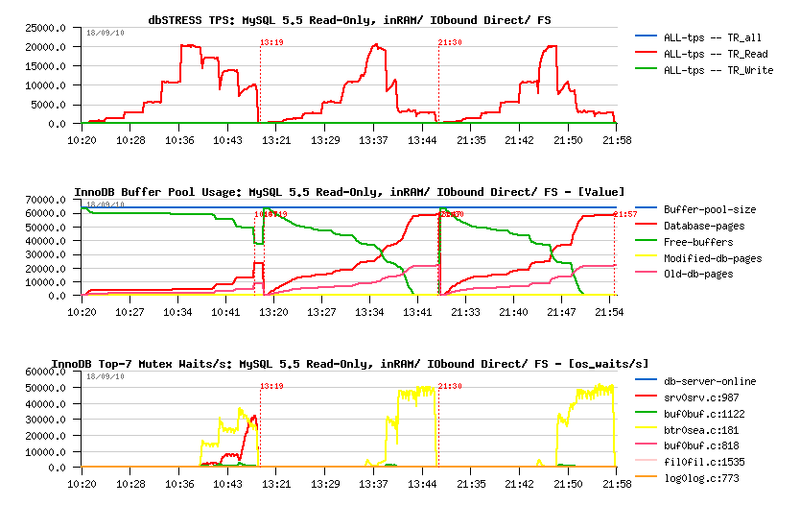 5.6 is looking better here, and RO optimization feature is slightly helping here too..
a short presence of contention on the log mutex in 5.5 is signaling here that one moment there was and I/O wait on redo writes in 5.5, but even before it, on the low load, 5.6 is still showing a better performance..
lock mutex waits are killing 5.6 since 512 concurrent users..
using small sort and join buffers (32K instead of 2M and 128K respectively) -- no difference..
using innodb_sync_array_size=32 in 5.6 (instead of default 1) -- no difference..
Well, this workload is not involving contentions on this stuff, so not really surprised..
Read+Write: more stable, but significantly lower performance.. While the impact is very depending on the workload, the feature like that is very welcome here! - the experimental concurrency management in 5.6 should be improved to become production ready. As well having improved Thread Pool extension here will change the things too! ;-)) To be honest, I think even once we'll fix any scalability contentions within MySQL and InnoDB, there will be still a need for a kind of concurrency management (e.g. thread/session pool, resource management) - any HW server + running OS has a limit of a number of tasks it can manage optimally.. - then after this limit you'll always observe a performance decrease ;-)) and the goal fo such a self-manager will be to never out-pass such a limit.. But well, time is pressing, and there was a one feature I wanted to test from a long time - a huge REDO log! (bigger than 4GB). 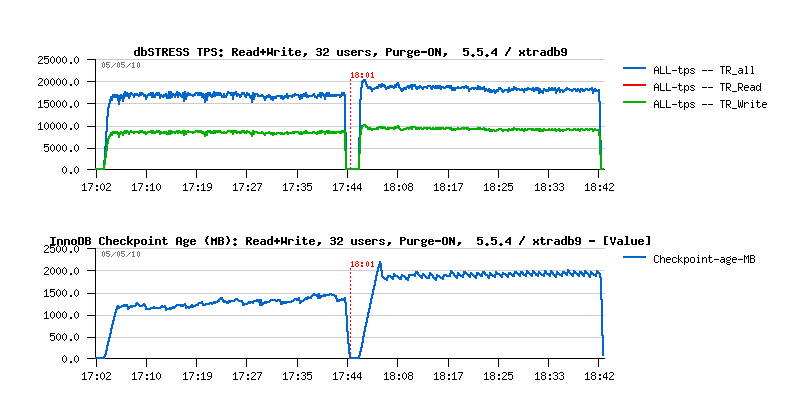 indeed, performance is worse with 12GB REDO vs 3GB..
such a degradation is explained by log mutex waits..
however, TPS level is still lower comparing to the initial results..
as you can see, InnoDB is reporting no page reads, only writes! the REDO log writes in the current InnoDB code are not aligned to any block size..
so, most of REDO writes are involving Read-On-Write operation (as the write record is not aligned to FS block size, FS has to read the block first, apply the changes from the record, and then write the modified block to disk)..
now, as REDO was increased to 12GB, once we've finished to write the last log and switching to write to the first one, the first log file will have many blocks already missed in FS cache, so they will be physically read from disk! no more log mutex waits, as expected..
however, missing some workload stability..
quite interesting that Checkpoint Age did not out-pass 4.5GB in case with 6GB REDO log..
think time between transactions: 0 sec. 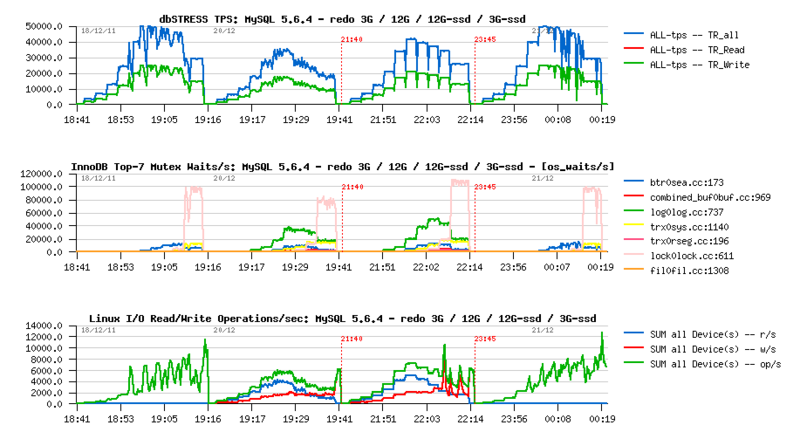 TPS and Query response times are collected live during all workloads..
To don't repeat again, there are just 2 links to the last graphs describing the Read-Only (here ) and Read+Write (here ). curiously the main performance impact is coming from reading! even Read+Write workload is more impacted by reading rather writing. Seems there were several problems at once.. 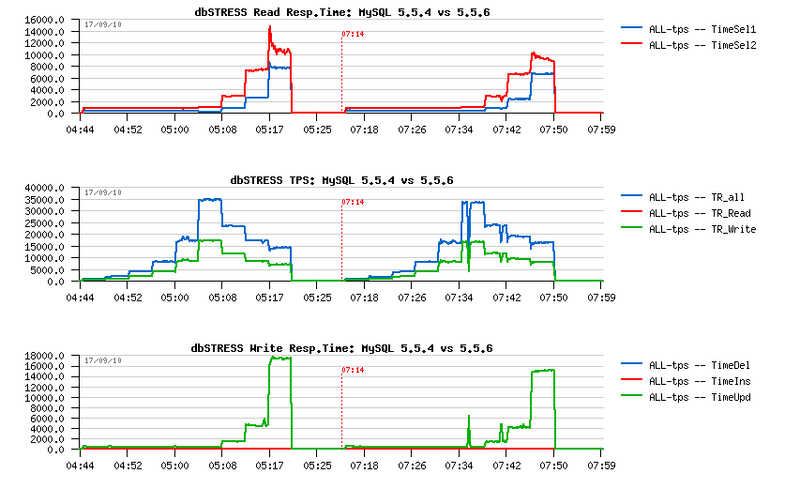 So, to understand one thing a time I'll try to split the issues and will keep the focus only on the Read-Only workload for the moment..
And now I'm happy to share with you my results obtained with MySQL 5.5.4 on dbSTRESS benchmark. 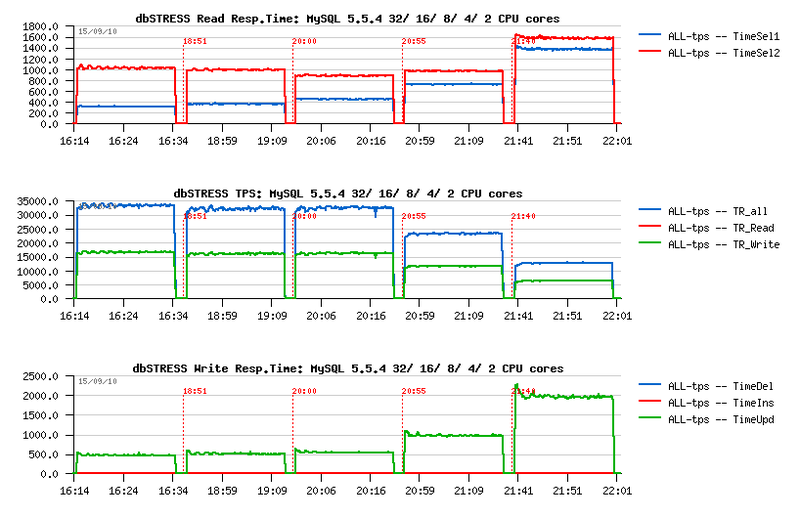 All tests were executed on the 32cores Intel server running Fedora 10 and having 128GB RAM and absolutely fast internal SSD drives (and if from the memory I've used only 16GB for the buffer pools, the SSD drives helped a lot to reduce any dependency on the I/O activity). suffix -prg1: means engine was started with a one purge thread (to see why separated purge thread is needed and what are the benefits you may read my benchmark report when we were the first to propose and published the purge thread patch.